I have wanted to cook cross-cut short ribs for a very long time. They always seemed so cute! And being able to enjoy short ribs without hours spent tending a dutch oven seemed too good to pass up, plus they’re a really great canvas for Asian-inspired flavors. David and I recently ate grilled short ribs at a Korean BBQ place in NYC, and they were off-puttingly crunchy (not in the cooked and crispy kind of way). They actually would have benefitted from a few hours in a dutch oven! This recipe gets around the too-crunchy problem with an acidic pineapple juice marinade that breaks down the meat before it ever meets heat. 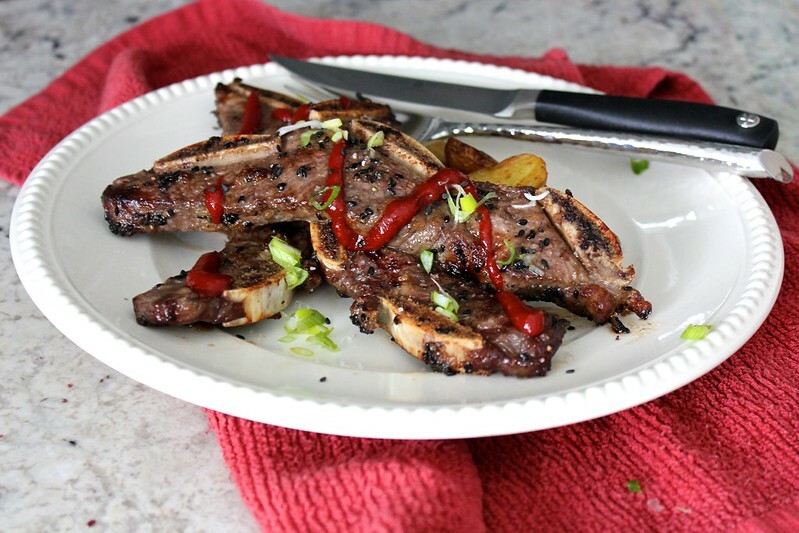 The finished result is short ribs with a pleasant bite- you won’t be able to resist eating them with your hands. And then licking your fingers. 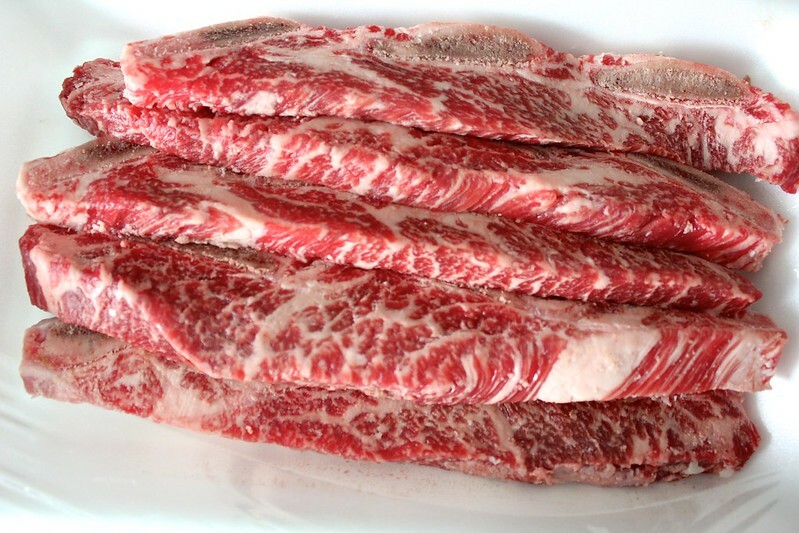 To make them, get 1 pound of bone-in cross-cut short ribs. This amount serves 2 as main course, but cut each bone apart, and they would make a really great appetizer. 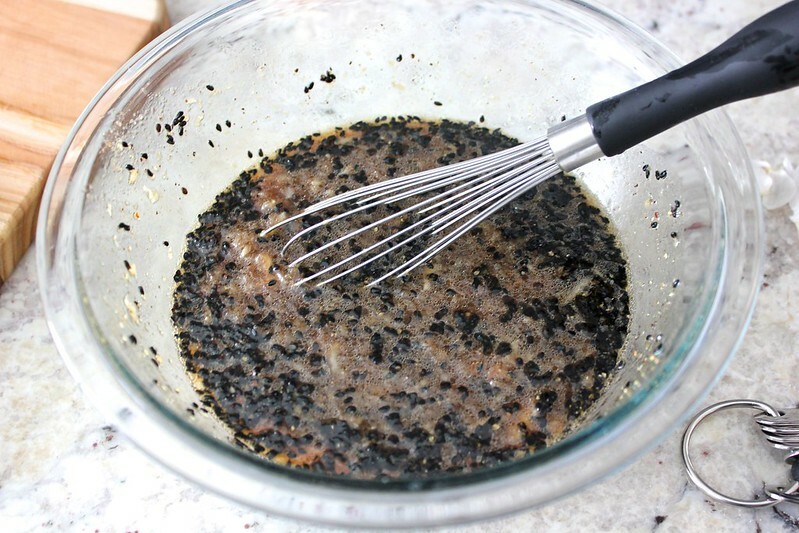 To mix up your marinade, stir together 1/2 cup of pineapple juice, 1/4 cup of soy sauce, 2 tablespoons of rice vinegar, 2 tablespoons of sesame oil, 2 tablespoons of toasted sesame seeds, 2 teaspoons of black pepper, 5 garlic cloves (grate into a paste using a microplane), and 1 small grated onion. 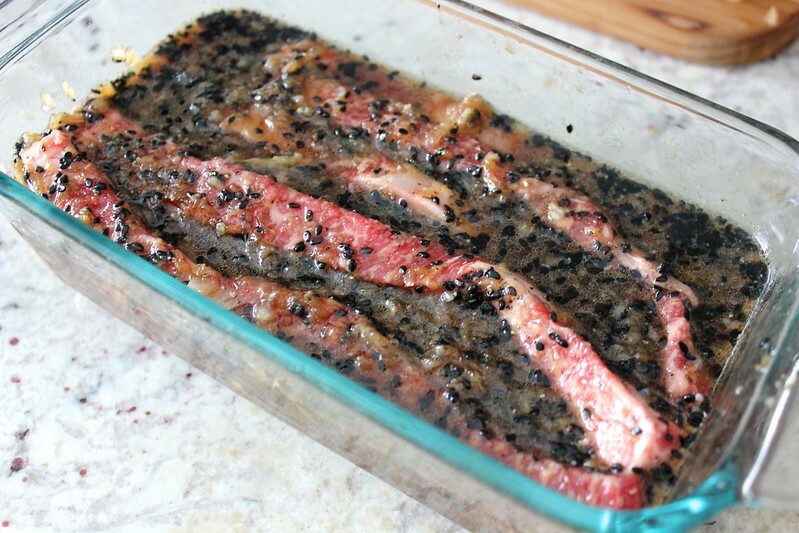 Add the marinade to your short ribs, cover them, and refrigerate them for 45 minutes. A loaf pan was perfect for holding my short ribs and marinade, but a plastic bag would work just as well. 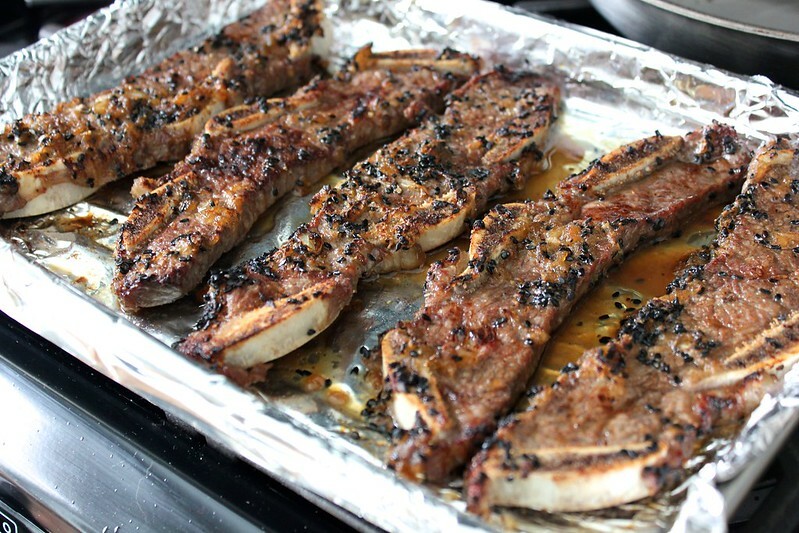 Once marinated, cook your short ribs, either on a grill or on a sheet pan under your oven’s broiler. Cook the short ribs for about 5 minutes per side until they are charred in spots (or longer, if you prefer). 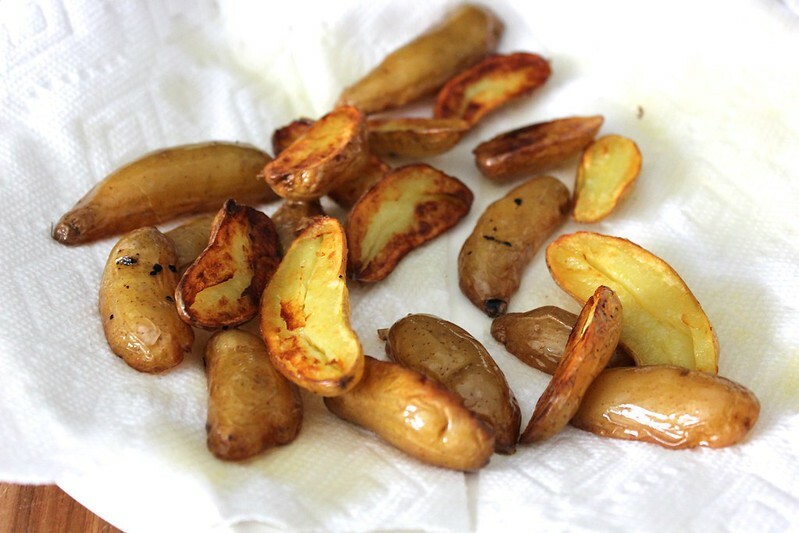 I served my short ribs with crisped fingerling potatoes– a really nice combination. You can find the recipe for those potatoes here. 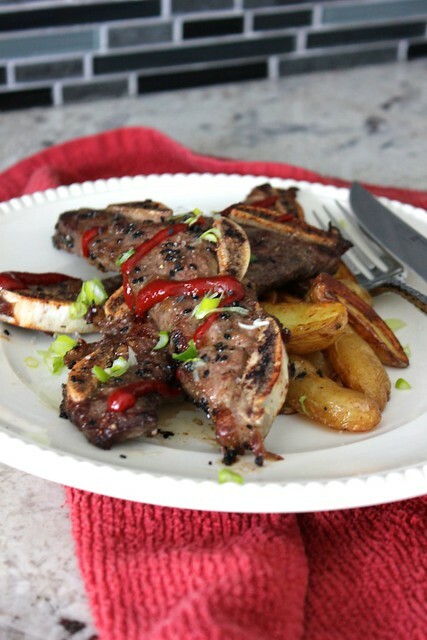 To serve, place your short ribs somewhat over your potatoes, drizzle them with spicy gochuchang sauce (or lightly with sriracha, if that’s more accessible to you), and garnish them with more toasted sesame seeds and some sliced scallion. Eat away! This recipe is from Saveur. I’ve never hear of a marinade made with pineapple juice. I’m going to have to try this.